Could MasterCard’s Profit Growth Accelerate in 2017? 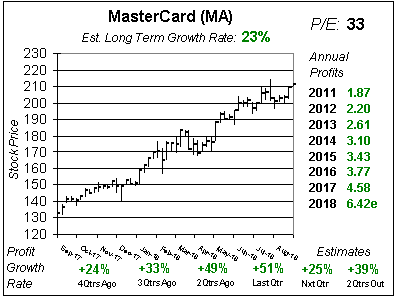 MasterCard (MA) could be in for better times ahead as the global economy is growing faster than last year. I’m not going to get into the specifics about world economies as I’m not an economist, but pretty much all the economic figures have been coming in above expectations. 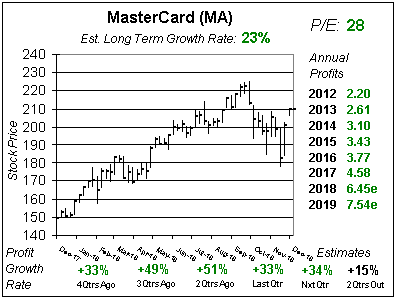 It would be great if MasterCard could pick up its growth rate, as profits grew just 11% in 2015 and 10% in 2016 after climbing 18% to 19% the prior three years. The company has been experiencing double-digit volume and transaction growth for a while now, but foreign exchange was reducing profit growth. Also, MA gives up-front incentives to banks to garner new business and this hurts profits in the beginning of the deal while helping profits further out. As it stands now, profits are expected to climb 9%, 10%, 12% and 22% the next 4 qtrs. But estimates got reduced for the next 2 qtrs so we can’t hang our hat on the hope that profit growth will return to the mid-teens this year. Management does expect mid-teens profit growth from 2016-2018 on low-double digit revenue growth, but that’s on a currency-neutral basis. The company does repurchase stock, so that should boost EPS. It just announced a $4 billion stock buyback program which will be on top of the current $4 billion plan. Overall this is a core holding for conservative investors, but a pick-up in profit growth would make it a good choice for growth investors as well. Profits have grown every year since the company went public, and MA yields 1%. The Estimated Long-Term Growth Rate is a solid 15% per year but unfortunately profits haven’t been growing that fast due to (1) a strong US dollar (2) F/X (3) a lackluster world economy and (4) up-front payouts for new business. Right now profits are set to grow 13% in 2017, but since estimates just came down a bit I don’t have faith that MA can grow in the mid-teens this year. At this point I have the stock in my Conservative Portfolio and have it on the radar for the Growth Portfolio with the intent to buy if it gets down below $100. Last qtr profits grew 9% on a 9% gain in sales as the company met analyst estimates. But qtrly and annual estimates ticked down a bit, and that should have reduced the stock’s momentum. Still, MA is right at its All-Time highs. I think this stock market is a little high, as core stocks such has this have been rising without the fundamentals improving. Qtrly profits are Estimated to climb 9%, 10%, 12% and 22% the next 4 qtrs. Since estimates just fell I can’t get excited about that nice 4QtrsOut estimate just yet. The P/E of 26 is reasonable for this stock. My Fair Value is a P/E of 26 which is pretty much what the stock has sold for since 2013. And with profit growth expected to be 13% in 2017 there’s no reason for me to think the P/E will go above 26. Still, there’s decent risk-adjusted upside of 16% for 2018, or 18% including dividends. MasterCard is a solid buy-and-hold stock that provides a good solid base for stock portfolios. Mutual fund managers make this stock a core holding in their stock accounts, which says a lot. There’s a lot to like here such as a solid Est. LTG of 15% a year, a 1% yield, a stock buyback program and high certainty as the company has grown profits in the double digits every year since it went public. MA ranks 15th of 30 stocks in the Conservative Growth Portfolio Power Rankings. I have it on the radar for the Growth Portfolio and will look to buy in if it corrects to $100.